For a FREE viewing, see below. 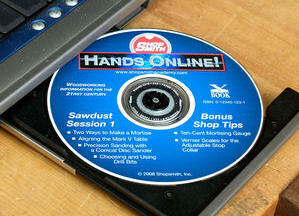 Each of our Sawdust Sessions and Video Shop Tips are recorded and archived in a unique DVD format called a "VBook." To each DVD video we add additional material to create a multimedia presentation -- close-up photos, illustrations, plans, instructions, links, sources, articles, programs, whatever you need to delve into the subject as deeply as you want. All of these work together to create a unique educational adventure. It's a DVD -- and a whole lot more! 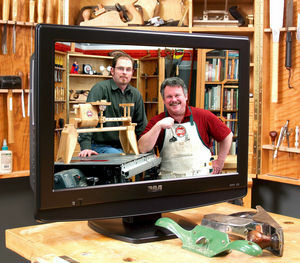 Each Shopsmith VBook covers several woodworking subjects and includes about two hours of video that you can enjoy anywhere at any time! Pop a VBook in your DVD player and a menu appears on your TV screen, listing the presentations available and their viewing time. Select the video you�d like to watch, press �Play,� and relax. When the presentation concludes, the menu reappears. 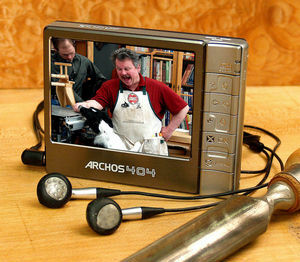 If you have a portable MP4 player, you can play the videos on it. Some players will also display text and graphcs in .pdf files -- of which there ar many in our VBooks. Connect your player to a computer with a DVD drive. Load the VBook and choose �Download Podcasts� from the menu. A page will appear with links to the videos and .pdf files. Use the recommended procedures for your player to transfer the videos and files to it. 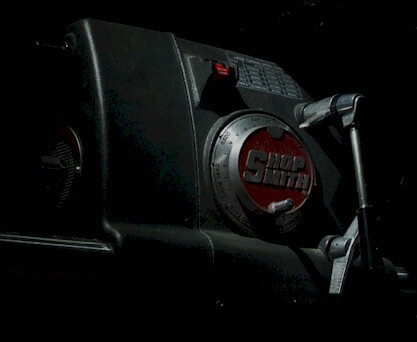 If you are unsure of these procedures, consult your player manual. 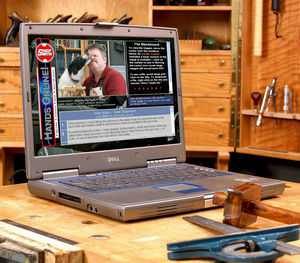 Load the VBook into a computer with a DVD drive and choose �Continue to VBook.� A web site appears. You don�t need to be connected to the Internet to use this site, but you must have a recent browser with a plug-in for Quicktime videos. (Click HERE if you need a Quicktime plug-in.) Click on a presentation and you see a �virtual classroom� with three independent frames which you control to display video, graphics, and text as you need them. 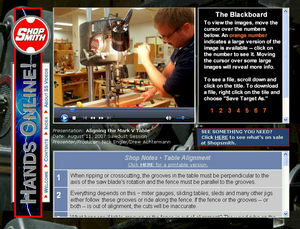 There's even a virtual classroom to show you how to use the virtual classroom! Perhaps the best way to explain a VBook is to let you experience one yourself. However, it's impossible to demonstrate a a disc that plays on three different media on the single medium. But we can give you a good idea. 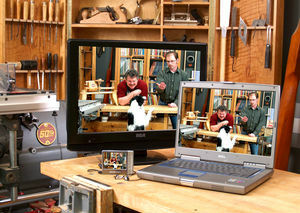 The televised portion of the VBook is an ordinary DVD with a standard resolution of 720x480. The video files for MP4 players are encoded in the H.264 "podcast" format and play at resolutions up to 320x240, depending on equipment. The most exciting portion of the VBook is designed to be viewed on a computer. 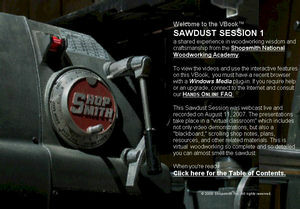 Derived from the "virtual classroom" of our Sawdust Sessions, it combines video with photography, illustration, text, and other resources in a unique and incredibly useful way. The DVD and podcast portions of the VBook are purely passive -- you just sit back and watch. The virtual classroom, however, is interactive. You control the flow of information and learn at your own pace. To experience this novel form of "edu-tainment," for yourself, click HERE.